I've been juggling several commissions the past few weeks and this is one of my favorites as it is so cheerful and fun! I have now started blocking in the color, I'm about 1/2 way finished with doing that. Then I will start going in for the detail, more than likely starting with Kadie herself as she is the star of the show!I just love everything about this shot! 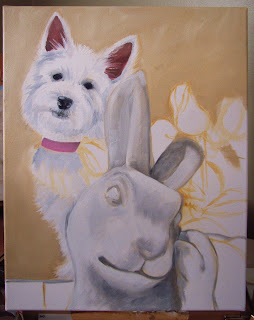 The colors, the angles, and I think it portrays the true spirit and playfulness of a Westie. 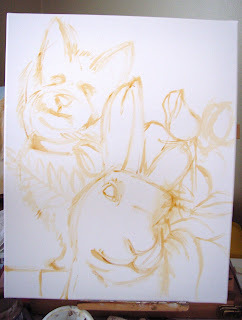 Stay tuned!If you would like to be a part of my Painting a Pup a Day project feel free to send me an email! "Radio - Can you say "cute"? This little 4 month old puppy was born blind and with a stub tail. His owners just didn't have the time for him - and so he came to us. The vets say he is completely healthy other than the loss of his sight - which is not reversible. Blind dogs are easy to live with, once they learn where things are - they are truly remarkable - - - - we've had several people adopt blind dogs in the past - - - - - - and I'm sure they would be more than happy to offer any help needed in transitioning this sweet puppy into a home. 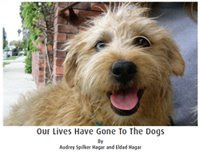 We would prefer that he go to a home without a lot of small children or rough playing dogs." If you think you can help, or are interested in adopting a Golden in need of a forever home, please visit Almost Heaven Golden Retriever Rescue! This is a small piece I managed to finish while continuing to work on several commissions. 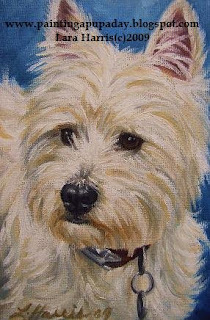 It is of an adorable Westie named "Loco,".I decided to paint this piece a bit looser and tried adding in some of the blues from the background into the white fur, and am pretty happy with the end result. 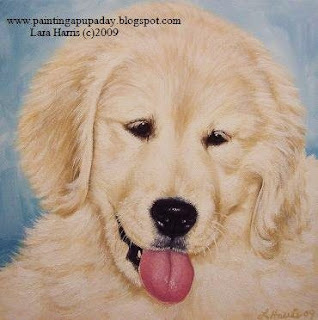 I look forward to experimenting a bit more with adding different colors into my work, some that perhaps one wouldn't expect to see, but that seem to really make a painting some alive!If you would like your dog to be included in my Painting a Pup a Day project feel free to send me an email! 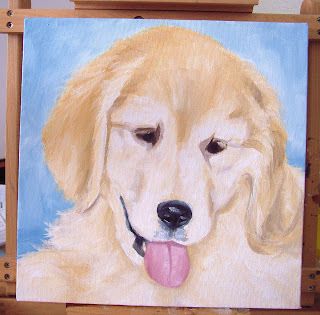 English Golden Retriever Puppy Painting in Oil, "Meg"
This is an oil painting of "Meg," an English Golden Retriever, hence why she is quite a bit lighter than a typical Golden Retriever. I was thrilled to get to paint this portrait as Meg has the sweetest face ever!There is nothing quite as cute or as soft as a baby Golden Retriever Puppy!I think her expression is one of enduring innocence. 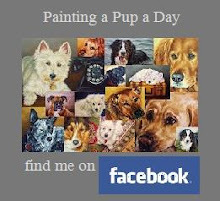 If you would like to have your dog be a part of my Painting a Pup a Day project feel free to email me at Loveall4Him@aol.com! Golden Retriever Portrait Painting "Meg"....Getting There! 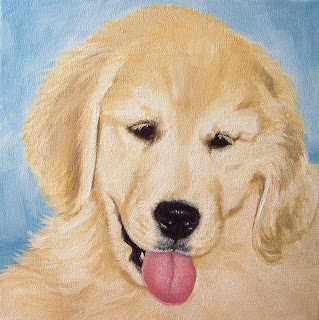 This is a piece I've been working on the past week or so, an adorable Golden Retriever Pup named Meg. I've enjoyed doing this piece as it is a bit larger, 12"x12", and a unique challenge as Meg's fur is really light in color, almost appearing white to some degree. I have to watch that I do not make the shadows too dark but still use the shadows to help define her mouth, ears, etc. I should be finished with this piece in the next few days, so stay tuned. If you would like to have your dog's portrait done as part of my Painting a Pup a Day project feel free to send me an email at Loveall4Him@aol.com and I can send you my price list and get your name on my current waiting list. 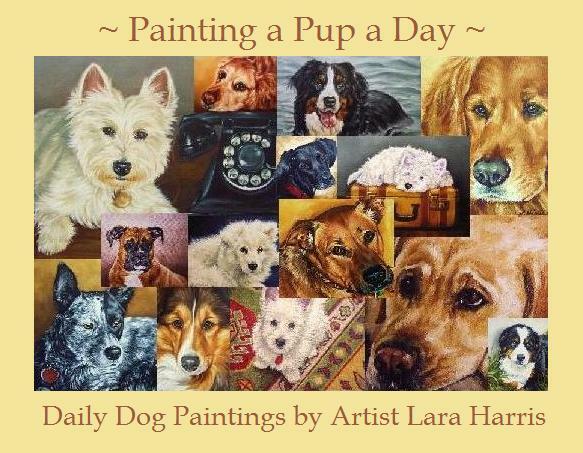 Dog Artists United...Bringing Together Some of the Best Dog Painters in the World! This week marks the beginning of a group I had wanted to bring together for some time, Dog Artists United. It is a select group of artists who paint dogs (as well as other subjects) and who happen to be some of the finest painters in the world! 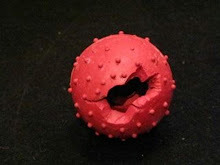 The group will be kept small, and each artist represented will be of a certain level of craftsmanship. 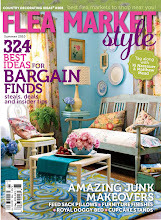 I'm excited to bring such wonderful artists together as Nancy Bailey, Sandy Byers, Jerry Hunsinger, Karry Johnson, Anna Usacheva, Akiko Watanabe, Sheila Wedegis, Laurie Pace, Mary Jo Zorad, and myself, Lara Harris. 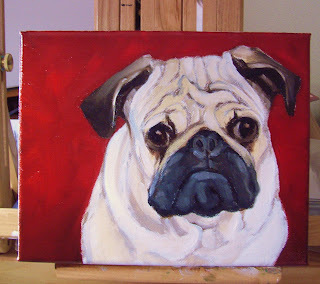 Be sure to stop in often and see what new paintings are up on the easel! Have a Blessed Good Friday!...& Special Thank you! First of all, let me wish everyone a blessed Good Friday! For Christians this is truly a very special time of reflection and I would just like to take this time to thank God and to thank everyone who has been such a blessing in my life. My family, friends, collectors of my artwork, and many wonderful fellow artists who have been so encouraging, helpful, and supportive! I am excited to get started on this piece as it is one of the largest dog paintings I have done thus far and Mrs.DeVincenzo could not have taken a more perfect and endearing shot of her little girl! The Canine Art Guild & Westie Rescue of OC & Beyond Charity Picnic! 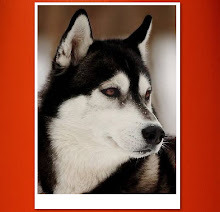 Some news of the canine persuasion here! 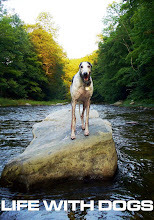 First of all, I am officially a member of the Canine Art Guild, a great group of artists specializing in dog art. Aside from that, I have created two groups known as Fine Artists of Michigan on both flickr and facebook. If you are an artist currently living in Michigan feel free to join these groups and upload your artwork!It's free and a great way to show off your work! 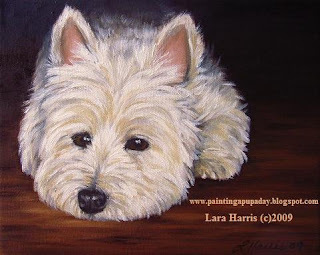 I also just completed a painting of an adorable Westie for the Charity Picnic being put on by Westie Rescue of Orange County & Beyond on Sunday, April 26 and this very painting will be auctioned off with 100% of the proceeds going to the rescue. There will also be a Custom Pet Portrait by me (Lara Harris) auctioned off as well, so if you are in the OC area at the end of this month be sure to sign up for this grreat event!